Akit's Complaint Department: À la carte Muni Passes when Moved to TransLink (Clipper)? À la carte Muni Passes when Moved to TransLink (Clipper)? Now that Muni is confirming a tiered system of passes (for all ages) where the cheap passes disallows passengers to ride peak express buses and cable cars, while the premium pass gives those privileges (plus BART for adults), maybe it's time for the SFMTA to restructure their pass system. August 1, 2010 (tentative) for "A" [premium] fast pass. February 1, 2011 for all disabled, senior, and youth passes. No known date for the "M" adult pass. I believe it may be worthwhile for Muni to take advantage of an à la carte program where passengers can choose based on their needs. Instead of Muni making eight types of passes, TransLink/Clipper makes it easy for someone to choose what they need with a push of a button or a click of a mouse. Anyone who wants to buy a pass must buy the "core" portion. This allows unlimited access to all basic Muni lines (regular, limited, and metro). Add express bus service for $5 (adults) and $2.50 for discount. 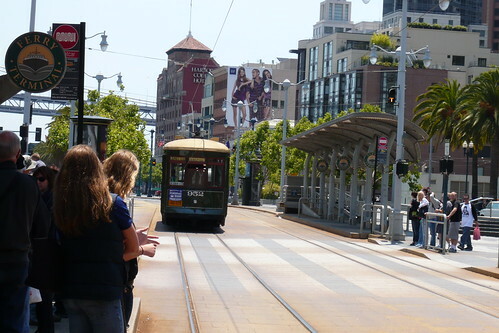 Add Cable Car service for an additional $5 and $2.50 for discount. This gives some flexibility on what the passenger needs. Why pay the $10 premium fee when you don't use certain services? Just pay a little more and get the privilege to ride what you need. I still support a need for a fare credit when a pass without a particular feature can just pay a small additional fee to cover that premium portion the passenger needs (e.g., 25 cent additional cost for the express if you don't have that feature on your pass). If Caltrain passengers can decide on which zones their pass can cover, pay extra if they want a Muni sticker, and pay a small fee each time they want to go beyond their zone, why can't Muni play along? VTA also does this by giving a $2 credit for pass holders who don't have express bus privileges, and the passengers just pay an extra $2 per ride. I don't think the SFMTA will go back to the simple style where one pass covers everything. But it could be possible that we may return to the time of the [Mayor] Frank Jordan era where the tiered pass system failed so badly that they turned back in less than a year. kind of late, but what do you think about the lifeline pass and putting that on a clipper card?